We are no longer offering low-cost liturgical supplies. All that we supply are required elements you cannot purchase elsewhere: Pre-Consecrated Hosts and Mikvek water. The links on these pages will take you to online companies who offer the basic liturgical supplies that we require for students. We make special recommendations for low-cost, high-quality items pictured on the pages. However, choose whatever you can afford. You can order liturgical supplies from these or other online companies by telephone, fax, or email. You will use these supplies throughout Diaconate and Priesthood training. Your investment will be less than $200 if you follow our recommendations. 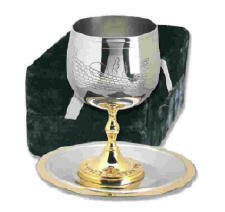 We recommend a specific form of the Jewish Kiddush cup in honor of the usage of the Master Jesus for use on the Eucharist Altar as well as at the Shabbat banquet; the rare Seven-Branched Menorah (used only in the Temple and Synagogues) for your Home Temple Altar; twin Shabbat candlesticks for Altar and Shabbat. These are appropriate for Subdiaconate and Diaconate training. 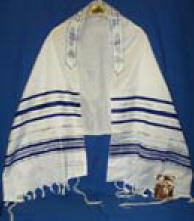 The versatile Jewish Tallit serves as the Home Temple liturgical Stole worn over a white linen robe or alb for Subdeacons and Deacons. The white robe may be of any kind (Catholic, Buddhist, Masonic, Golden Dawn, Druid, Wiccan, Martial Arts, etc., depending upon spiritual orientation). Priests and Bishops are free to vest as they wish. High-grade rose essential-oil preparation; sacred spring water from Mount Shasta for infusing the Temple Mikveh or ritual ablution; and, a special castille soap mixture for Mikveh preparation. The Mikveh water is formally consecrated for sacred use in seminary training by the Presiding Bishops of the Home Temple. Rose oils and the ingredients for Temple Soap can be purchased at health and natural food stores. Students are encouraged to find their own suppliers for these. If not, look in our link page. Publications of the Home Temple other than Diaconate and Priesthood modules. including PowerPoint classes on CD-ROM and various tapes and writings by Bishop Keizer to supplement basic studies. Most of these are available of the wisdomseminars.org Catalogue page. A page of links covering special topics like the Dead Sea Scrolls, etc.